AMPCO METAL, as a successful, well-established integrated producer and distributor of specialty metals, brings vast experience and expertise to solving wear and corrosion metal problems. 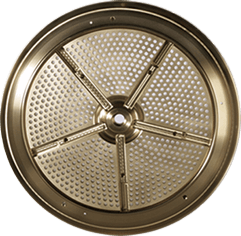 AMPCO METAL’s secret goes beyond using the finest materials and meticulous controls; it lies in the process itself. 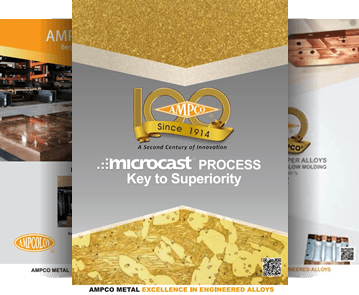 This process, a unique manufacturing method named MICROCAST®, allows an optimal control the grain size, density and dispersion of the inter-metallic compounds, which contributes so much to the rugged wear resistance of AMPCO® alloys. In wear applications, they are used as brake pads for roller coasters, worm gear wheels, wear plates, bearings and all types of friction applications in mechanical engineering. Aluminum Bronzes, copper alloys containing aluminum as the principal alloying element, are renowned for their high strength and excellent corrosion resistance. This strength is similar to that of medium-carbon steel and the alloys’ exceptional corrosion resistance enables users to take full advantage of this feature. For help determining the alloy and the product that best meets your needs, contact your closest AMPCO METAL sales engineers today. Copyright © 2018 AMPCO METAL SA - All rights reserved.